Stephens Media LLC (“Stephens”), the owner of the Las Vegas newspaper The Las Vegas Review Journal, has sued three companies for trademark infringement over the use of the mark “The Best of Las Vegas.” Two of the lawsuits were filed earlier this week and one filed earlier this month. See Stephens Media LLC v. Gault Millau, Inc., Case No. 09-cv-02403 (D. Nev. December 21, 2009) (complaint here); Stephens Media LLC v. US Commerce Association et al, Case No. 09-cv-02405 (D. Nev. December 21, 2009) (complaint here); and Stephens Media LLC v. CitiHealth, L.L.C., Case No. 09-cv-02285 (D. Nev. December 2, 2009) (complaint here). An article on the lawsuits, written by the Las Vegas Sun (the print version of which is owned by a separate company, but distributed with the Review Journal), can be found here. 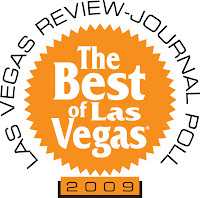 The word mark BEST OF LAS VEGAS for “providing a web site featuring business and consumer preferences and recommendations regarding people, places, goods, services, restaurants, entertainment, arts, sports and recreation in the Las Vegas area. According to the complaint against Gault Millau, its travel website gayot.com has a section named “The Best of Las Vegas Top Restaurants Hotels Travel Guide” (click here to see what I could find) that Stephens finds infringing. As for the complaint against US Commerce Association, the company is allegedly selling “award” plaques ($80 each) or award trophies ($180 each) to small businesses by sending e-mails stating that they have won a “Best of Las Vegas Award” which are bestowed upon such businesses by US Commerce Association. [Comment: kind of like those scam Who’s Who’s directories that will honor you by listing you in their "Who's Who" book – with the payment of a fee which gets you a copy of the book listing the names of thousands of others suckers as well as a pretty piece of paper]. Stephens feels that the company's actions harms the goodwill associatd with its “Best of Las Vegas” marks. So you can cut and paste all of Greenspuns IP (intellectual property, and I use the word intellectual quite loosely and in a legal context) or 'content' if you prefer, post it here, and derive an income stream from it? And the LV Sun actually links to you as a place linking to them? Thanks for the kind words. I always strive to write something interesting each time, but even now, I have my good days and bad days. And its often tought to find the time to write someting creative when you are having to deal with deadlines and clients that are paying you to write for them.